The Saint Zita Society is an upstairs/downstairs-type story about the servants who live in Hexam Place, London. The eponymous society is a loosely organized servant union that serves as little more than a chance for the servants to get together and talk. 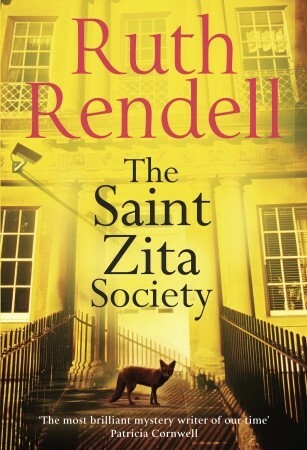 Ruth Rendell is primarily known as a crime writer, and a crime is indeed committed midway through the book. However, the focus of the story is on the soap opera-like relationships between the residents of the building. “What are you then?” said Beacon. I love the glimpse into the perceived social hierarchy even within the “downstairs” world, and I found Thea’s desire to connect with her “upstairs” world landlords on an equal footing tragic. I’m a major fan of crime fiction, but to be honest, I would have preferred it if Rendell hadn’t included the crime element at all, nor the menacing presence of a character who thinks a god speaks to him over his mobile phone. Rendell had created such a rich world with her characters that I wanted to spend more time exploring their lives, without (and this feels very odd for me to say) being distracted by the crime angle. I also wanted the Saint Zita Society to play a larger role in the story. Admittedly, this may just be a personal preference on my part rather than a commentary on the quality of the storytelling, but given the major social gap between the servants and their bosses, I would have loved to see how the bosses would have reacted to the servants actually taking a stand. Rendell does touch on some injustices, such as Thea’s invisibility to her landlords and the pressure exerted upon a young valet to sleep with his boss’s wife, even though he is really interested in the daughter. However, she pulls short of focusing on the social commentary, and personally, I think that would have made the novel more interesting. Finally, I really, absolutely hated the ending. To be fair, this is an emotional reaction more than an objective assessment of the quality of the ending. I don’t know if it felt as rushed and unnecessary to other readers as it did to me, but in any case, I was pissed off at what Rendell did with one of the characters. So if the author was attempting to elicit an emotional response, she succeeded. Still, I hated it. Overall, Saint Zita is a good book. The characters were engaging, and the multiple story lines fascinating. Still, even without taking into account the ending, I wish Rendell could have done much more with it. This entry was posted in Book Reviews and tagged 50BookPledge2012, Fiction, Mystery, Random House by Jaclyn. Bookmark the permalink.